NASCAR betting is just like any other sport–you have to put in a lot of handicapping work in order to have long term success. The good news is that few sports offer as much ‘mission critical’ statistical information for the bettor as NASCAR. There are not only in-depth statistics available for every race but also for qualifying and practices. In addition, there’s a wealth of information available online from serious NASCAR experts–not mainstream sports media types pretending that they’re experts. It’s important to pay attention to what goes on during the week leading up to race day. During this time, there is qualifying and practice sessions. NASCAR releases timing statistics on all of it. Practice and qualifying are your first–and in many ways your best–opportunities to see which cars are running well on a specific track and which ones aren’t. If you see the same driver at the top of the board for qualifying and each practice session, there’s a good chance he’ll run well on race day. There is a corollary to this rule–some teams will have mastered the car setup for the track to the extent that the practice sessions are completely irrelevant. In this situation, the crew chief will often try different things with the setup or ‘tinker’ with it trying to make it all the better. A good ‘tell’ for this scenario is when a driver that qualifies well ‘struggles’ during subsequent practice sessions. An even better ‘tell’ is to hear it from the ‘horses’ mouth’–on many occasions a driver or crew chief will come out and say that they’re happy with the car set up but ‘trying some new things’ during practice. In many sports, player and coach interviews are downright useless for handicapping purposes. You’ll hear the same pat answers and time-worn cliches regardless of the situation. Not so in NASCAR–the stereotypical driver interview where he gives an upbeat assessment of his car while thanking the sponsors is more punchline than reality. NASCAR gives the media more ‘unfiltered’ access to drivers and teams than other sports. Furthermore, most drivers and crew chiefs are very honest and disclosing about how things are going in the garage. You’ll often hear a driver say ‘we don’t have a top 5 car this week’ or ‘it looks like we’ve got the fastest car in the field.’ You should pay attention to comments of this type and especially critical assessments of a car’s performance by a driver. Just paying attention can provide a wealth of handicapping information that might not show up in the statistical data. In horse racing, there’s a concept known as ‘horses for courses’. Simply put, it means that some horses perform better at certain tracks or surfaces. The same thing exists in NASCAR racing as well. Some drivers perform well at certain tracks and not at others. Some drivers struggle throughout the schedule but are very competitive in certain spots. Marcus Ambrose is a perfect example–he’s mediocre at best on oval tracks but a high-level road course racer. His two career NASCAR Sprint Cup wins have come on the road course at Watkins Glen. You’ll learn a lot just by watching how drivers perform at certain tracks or types of tracks, but there’s also plenty of statistical data to work with as well. There’s plenty of driver performance data for every NASCAR track covering not only races but qualifying and practices. With this information, you can compare performances from one year to the next–some drivers improve as they gain experience on a particular track, and this is a good opportunity to find value. 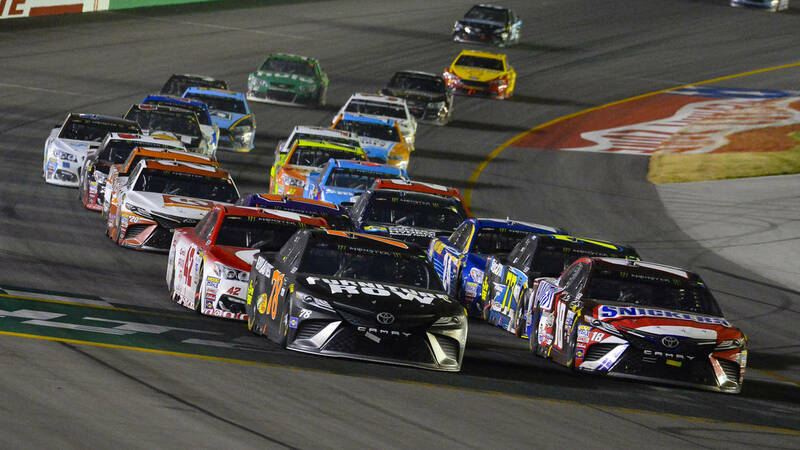 ‘Current form’ is an important factor in any sport–team or individual–but NASCAR is especially streaky. Good drivers can underachieve for months, or even an entire year–take Kyle Busch, usually a top driver, but who won only a single race in 2014. Underperforming drivers can move into the ‘top tier’–either for a short period or permanently. Kevin Harvick was a good though not great driver for much of his career. In 2010, he started to ‘take his game to another level’ which culminated in winning the 2014 Sprint Cup Championship. More common, however, are ‘short term form’ issues. A team might have problems with engine durability and for a stretch of several races that will cause problems. Eventually, they’ll figure out what’s wrong but until they do their driver becomes a good ‘go against’ in matchups. Kyle Busch is a first rate driver but during the early part of the 2012 season his engines would blow up on what seemed like a weekly basis. This short term mechanical issue wasn’t a factor in the betting odds, and the knowledge of the engine problems alone was useful in finding value. Boxers are notorious for ‘hanging on’ and continuing to compete past their prime. Race car drivers may be even worse. An important component of the driver’s value to his team is popularity–it’s essential for attracting sponsors. This reality also means that a popular driver can stick around well past his competitive prime just because the fans like him. It’s important to know when a driver is ‘past his prime’–at this point career stats become irrelevant for handicapping purposes. Among many examples–Bill Elliot at one point was the ‘baddest man on the planet’ behind the wheel of a race car. He didn’t retire until 2012, but last won a race in 2003. The opposite situation is also common–a driver may struggle for a number of years before he finally ‘gets it’ and becomes an elite level competitor. Current driver Joey Logano is an example of this career trajectory–he came into the sport highly touted but struggled through his first few seasons. After a move to a new racing team in 2013 he’s become one of the top drivers in the sport, finishing fourth in the 2014 standings.